On January 3, the 115th Session of the US House of Representatives gaveled out and immediately thereafter, the 116th Congress, fresh off caucus elections of new leadership, gaveled in. New House leadership was elected. At the conclusion of the vote for Speaker of the House, which is now under Democratic control, Nancy Pelosi (D-CA) was installed with 220 votes to 192 votes cast for Kevin McCarthy (R-CA). A handful of other members received nominations and votes for the position of speaker. The aggregate total among other members was 18 votes, far too few to upset the calculus. The majority of votes were cast along party lines, divided between Pelosi and McCarthy. Immediately after the 2016 elections, the newly installed Donald Trump administration quickly moved to consolidate power by filling its cabinet with loyalists to whom he immediately gave a primary mandate: unwind Obama-era regulatory changes. The 2018 midterm elections saw historic gains and change within the House Democratic Party leading to a split in previously held single party rule. The 116th House member count stands at 235 Democrats to 199 Republicans. All three branches of government—Executive, Legislative, and Judicial—saw change in 2018. After the January 3 House leadership vote, Republican Leader McCarthy (absent retired Republican Speaker Paul Ryan), ceremonially handed the Speaker’s gavel to Pelosi, underscoring the smooth transition of American government and power. The new Congress was set. With 2018 elections leaving the Senate in Republican control, no leadership changes took place in the upper chamber. 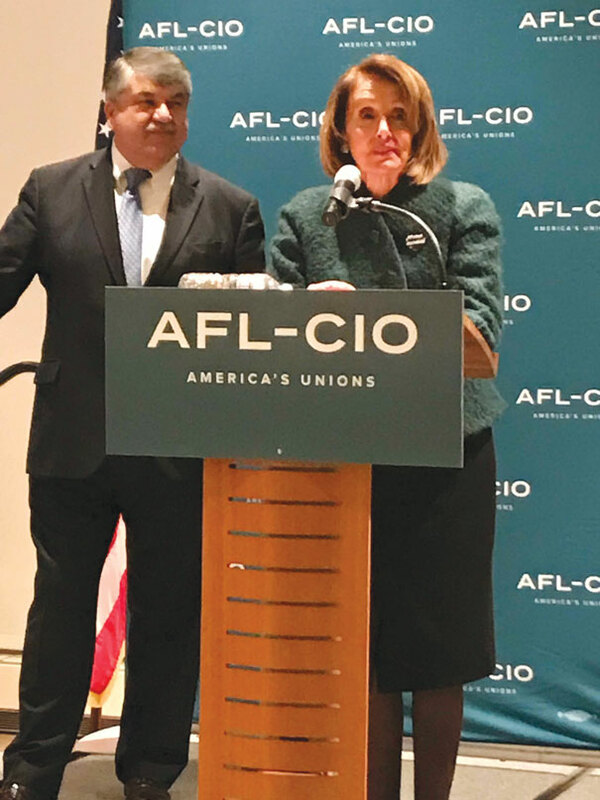 In January, AFM Legislative and Political Director Alfonso Pollard attended an event at the AFL-CIO hosted by AFL-CIO President Richard Trumka and House Speaker Nancy Pelosi. The purpose of the event was to introduce new members of Congress and key Democratic Committee chairs of the newly minted 116th Congress. The event was well attended by union officers and staff. Though no elections were held for president, the stability of the president’s administration has been challenged by high-level resignations and firings. In the Senate, the Republican majority remained in power, Democrats 47 (loss of 2) and Republicans and 53 (gain of 2). Search for your US Representative and Senator by typing your address and clicking the state at: https://www.govtrack.us/congress/members. The US is now confronted with a divided government. At the outset of the 116th Congress, this will embolden each party to fight hard for the ideals they believe their American constituents sent them to Washington, DC, to protect. Major issues such as immigration reform, border security, healthcare, job security, efficient government, retirement security, and a stable social security system are at the top of the American public’s list. It is hoped by all that a cooperative resolution to the current government shutdown will be illustrative of how bi-partisan comity can and will positively affect policy issues.